Tim Slade’s #47 Lucky 7 Racing Falcon is sporting some new livery this weekend, with the announcement that Lucky 7 Convenience stores will be trialing two new concepts with the help of the Stone Brothers Racing entry. “Essentially we’re capitalising on our relationship with SBR to help raise the profile of the two concepts we are currently piloting,” said Craig Matthews, National Marketing Manager for Lucky 7. The first sees the amalgamation of Blockbuster and Video Ezy outlets, with the Lucky 7 Convenience store franchise. The ‘store-in-store’ concept will integrate Lucky 7 into a select number of video stores, and stock over 500 different products from newspapers and bread, to milk and snack foods. A successful trial could see Lucky 7 stage a presence in over 650 video stores nationally. The second program being run by Lucky 7 will see the rear-quarter panel of Slade’s #47 machine rotate a variety of Lucky 7 supplier’s brands throughout the rest of the season. “A race-by-race rotation of brands on the #47 Falcon allows a more flexible platform for our partners, which can be customised according to their requirements and timings such as new product launches,” Matthews said. “SBR and V8 Supercars provide us with a fantastic medium through which we can reach our audience, and Tim’s recent strong performances certainly help our cause,” he added. 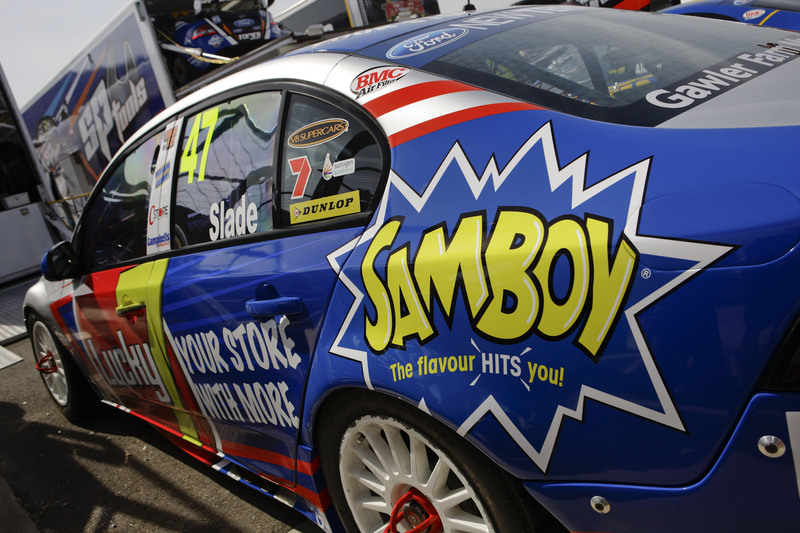 This weekend, Slade will be looking to maintain the good form he displayed in Darwin, where he recorded his career-best V8 Supercar result. ← Ken Block Takes Goodwood Festival Of Speed Hooning Award, Again!